Aerial photograph of the study area in Hanko Bay, Finland (Dr. Joonas Virtasalo). 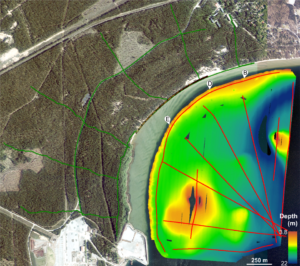 At this years meeting of the European Geoscience Union in Vienna, you have the chance to learn more about the newly discovered submarine groundwater discharge (SGD) sites at Hanko Pensinsula, Finland. Read the full scientific article ‘Submarine groundwater discharge site in the First Salpausselkä ice-marginal formation, south Finland’. Find the full EGU 2019 programme here.